Gyeonggi Museum of Modern Art presents the exhibition under the title Winter Winter Winter, Spring which is focused on DMZ and peace. 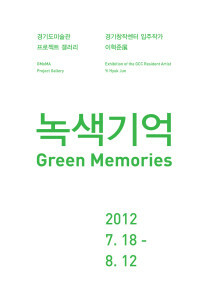 This exhibition also invites picture book and contemporary artists from Korea, China and Japan. A sound installation work of the roar of the waves as a symbolic being which connects islands in East Asia under turbulence. The weight of a curved history is replaced with the roar of the waves from the fresh vast Pacific Ocean. An overall concept of the exhibition is relaxation and pipingness to leave for the shores of islands. The audience can move freely to an island where he/she wants in a hammock, and even enjoy the exhibition lying on it. 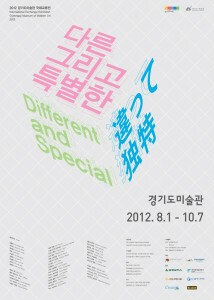 The GMoMA presents Different and Special, an exhibition that brings the works of Korean, American, and Japanese disabled artists together in 2012. There are many types of disabilities but this exhibition focuses primarily on developmental disorders that are the hardest to understand and recognize and for which there has been a lack of institutional support for social adaptation. Distinctive aesthetics incarnated by artists with developmental disorders living in a unique, special world are presented from a new perspective in approximately 400 works including paintings, drawings, three-dimensional works, installations, and videos. These are superb works of contemporary art that convey distinctive stories alongside relevant materials. At a glimpse, YI Hyuk Jun’s photographs seem as though they have been taken in a jungle. When viewing them, one may feel as if they are trapped in a forest labyrinth or completely surrounded by a sylvan area whose exit is hard to find due to the undergrowth of densely packed large leaves. Something resembling a concrete structure standing in the shade of the trees and leaves enables viewers to realize that this space is not a grove and escape from the maze. 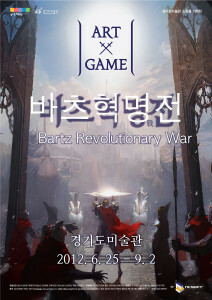 Korean MMORPG(Massive Multiplayer Online Role Playing Game) is a PC game which users access multiplex Internet at the same time, receive their own roles, and perform their missions based on proposed stories. Unlike a classic role-playing game which two or three people enjoy, a number of people can participate in this game simultaneously as implied in the title, ‘Massive Multiplayer Online Role Playing Game’. Also, it goes on regardless of user’s participation, which is different from single or multi play games that end when the winner is determined. Once an MMORPG game begins, it continues without stopping or starting again. Basically, the MMORPG game has events related to stories. All the players joining in the game can enjoy stories, talk one another, and trade game items(goods used in the game). Since the participants live in real time, sharing or trading items and information, a fine line between imagination in the game and the actual reality becomes obscure. 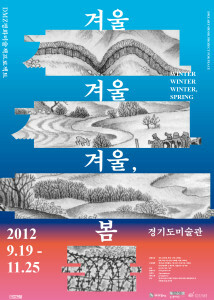 CHANG Yujung displays photographs of nature found in Seongamdo in Ansan where the Gyeonggi Creation Center is located. She had taken these pictures during her stay at the artist-in-residency program. Her photos are printed on a translucent material which arouses a surrealistic atmosphere that reconstructs the space as it allows light to pass through it. The places in the images are physically experienced when artificial light takes on the role of sunlight, illuminating her pictures and making two-dimensional scenes feel like three-dimensional ones.